Ultimate Fighting Championship (UFC) is bringing a bevy of “Prelims” fights to both UFC Fight Pass and FOX Sports 1 this weekend (Sat., Aug. 25, 2018) when UFC Fight Night 135: “Gaethje vs. Vick” storms Pinnacle Bank Arena, Lincoln, Nebraska. MMAmania.com’s Patrick Stumberg continues the UFC Fight Night 135 “Prelims” party with the second — and final — installment of a two-part undercard preview series below. It’s time for less than five rounds of Lightweight action! Human bonus-winning machine Justin Gaethje and surging contender James Vick take their feud from Twitter to the Octagon in Lincoln, Neb., this Saturday (Aug. 25, 2018), headlining UFC Fight Night 135 inside Pinnacle Bank Arena, which will air live on FOX Sports 1. UFC Fight Night 135’s main card will also feature Bryan Barberena vs. Jake Ellenberger, Deiveson Figueiredo vs. John Moraga, and Eryk Anders vs. Tim Williams, among others. We’ve got four more UFC Fight Night 135 “Prelims” undercard matches to check out before that, though (check out the first batch here), so let’s continue, shall we? 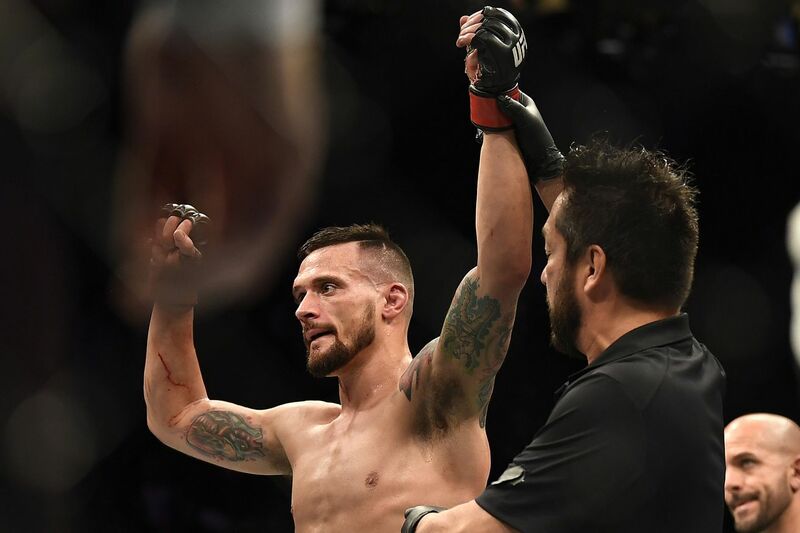 Despite riding a two-fight win streak, James Krause (23-8) elected to try his hand on The Ultimate Fighter (TUF) 25, where he picked up another two wins before falling to Jesse Taylor in the semifinals. He has since notched victories over Tom Gallicchio and Alex White to move his UFC record to 6-3. He stands three inches taller than Warlley Alves (13-2) and will have an inch of reach on him. Alves followed up his dominant TUF: “Brazil” run with four consecutive Octagon victories, only to drop consecutive bouts to Bryan Barberena and Kamaru Usman. He has since gotten back on track with wins over Salim Touahri and Sultan Aliev, the latter of whom he finished via grotesque eye swelling. Four of his six submission wins have come by guillotine. Assuming he doesn’t have issues making the cut, I’d prefer to see Krause at 155 pounds. At Welterweight, he’s going to struggle against more physically powerful foes, a bill which Alves fits nicely. He’s got the heavier hands of the two and should be able to power through Krause’s long-range offense to do damage on the inside. I’m not convinced Krause has the firepower to keep Alves off of him, and judging by that less than 20 percent takedown accuracy, he’s not shutting down Alves the way Usman did. Alves’ steady pressure stifles Krause’s kicks and allows him to beat up the head and legs for a clear decision. Two knockout victories in a combined 4:07 erased the memory of Cory Sandhagen’s (8-1) lone career loss and brought him to the Octagon this past January on an eight-day turnaround. The short notice proved no issue as he put away Austin Arnett with body shots in the second round. He’s two inches taller than Iuri Alcantara (36-9), but will give up an inch of reach. Alcantara’s comeback kneebar of Luke Sanders gave way to upset losses to Brian Kelleher and Alejandro Perez, the former of whom handed “Marajo” his first submission loss since 2009. He went on to prove he was still dangerous by thrashing Joe Soto in 66 seconds to secure his fourth post-fight bonus in his previous six fights. He has knocked out and submitted 14 opponents apiece. As great as the Soto knockout was, it feels like Alcantara’s flashes of brilliance are getting fewer and farther between. “Marajo” took a career-altering beating from Sanders before pulling off a Hail Mary submission and sleepwalked through his fight with Perez. He’s also closing in on 40 years old, meaning that freak athleticism may not last much longer. Sandhagen, meanwhile, is a decade younger and a much smoother striker. His body attack should work well against the explosive Brazilian and Alcantara’s never been a consistent takedown artist. Barring one of the bursts of violence “Marajo” is known for, Sandhagen avoids the big left hand and out-boxes him for 15 minutes. Andrew Sanchez (9-4) looked poised to make waves in the division after a strong TUF run, dominating Khalil Rountree and defeating Trevor Smith in his first two Octagon appearances. His cardio issues have since reared their heads, allowing underdogs Anthony Smith and Ryan Janes to knock him out in brutal fashion. He has knocked out five opponents and submitted another two. Markus Perez (10-1) made the most of his first LFA appearance by choking out future “Contender Series” standout Ian Heinisch to win the promotion’s Middleweight title. He fell to Eryk Anders in his short-notice Octagon debut, but picked up his first UFC victory in May with a submission of James Bochnovic. “Maluko” steps in for Antonio Braga Neto on three weeks notice. Sanchez could really be something special if he could learn to pace himself. Solid wrestling and Brazilian jiu-jitsu with serviceable striking is a quality skillset, even it’ll never carry him past the monsters waiting at the top of the division. I’m going to go out on a limb and say he wins this, even if that seems hypocritical given how I talked about Jon Tuck yesterday. He just seems like he can outclass Perez in the latter’s area of expertise, and I’d imagine that thrashing from Ryan Janes has taught him not to blow his wad early. This is the last shot I’ll give him, but I say Sanchez comes up big with his back against the wall and mixes boxing and takedowns for the win. Mickey Gall (4-1) rose above his Octagon origins as a C.M. Punk opponent to become a genuine contender with his 2016 submission of Sage Northcutt. He had some good moments, but couldn’t do the same to Randy Brown at UFC 217, resulting his first-ever professional defeat. All four of his professional mixed martial arts (MMA) wins have come by rear-naked choke. George Sullivan (17-6) started his UFC career strong with wins over Mike Rhodes and Igor Araujo, closing as the underdog in both fights. He’s just 1-3 since, suffering stoppage losses to Tim Means, Alexander Yakovlev and Niko Price, and faced a two-year layoff because of USADA issues. “The Silencer” has knocked out 11 professional opponents. This is a fairly obvious get-well fight for Gall, albeit one with the slightest tinge of danger. Sullivan is a threat on the feet and showed some nasty ground-and-pound against Araujo. That said, he looked hopeless on the ground against Niko Price, who struggles in most aspects of the game that aren’t punching people extremely hard, and has been taken down at least twice in every UFC appearance. Heck, Dom Waters got him down five times. Gall’s going to get him to the mat as soon as he wants to, and from there it’s just a matter of time until he takes the back and puts on the squeeze. Justin Gaethje means I’m tuning in, no questions asked. See you Saturday, Maniacs. Remember that MMAmania.com will deliver LIVE round-by-round, blow-by-blow coverage of the entire UFC Fight Night 135 fight card this weekend, starting with the Fight Pass “Prelims” undercard bout at 6:30 p.m. ET, followed by the FOX Sports 1 “Prelims” undercard bouts at 8 p.m. ET, before the main card start time at 10 p.m. ET (also on FOX Sports 1).